Beautifully Chaotic Designs: Got Hair? We Do! I'm using string in this method, but if you want to use elastics just braid as described and use the elastic at the bottom of the braid. Also please note that I am using constrasting colours of string and dreads to illustrate the method better. 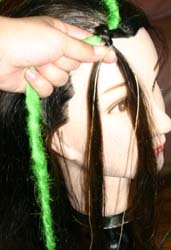 If you use a string colour that matches your hair it will be invisible and you will not see it. 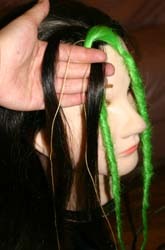 This string method is particularly useful when you don't want the elastics to be visible on your double ended dreads. The string I use is crochet thread (size 10) available at your local craft store. DO NOT USE WEAVE THREAD as it is slippery and will loosen at the knot and fall out. 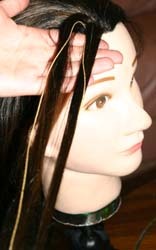 Take a section of hair, anywhere from 1/2" (1.25cm) to 1" (2.5cm) square. Split this section of hair in two. 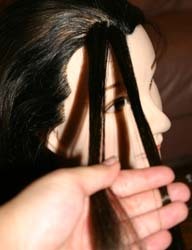 Take a piece of string cut three times as long as your natural hair and fold it in half. 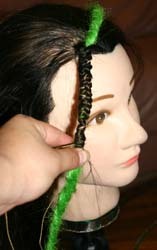 Put the middle up against the scalp, and have each end side of the string combine with each half of the section of hair. 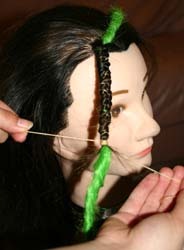 Place the middle of the double ended dread in between the two halves of the section of hair and string. Bring one side of the section across the dread to the other side. Crisscross the section that didn't cross over the dread on top of the section that did. 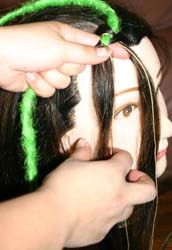 Pull this top section underneath the dread and on the other side. Repeat the 2 steps above. Across the dread. 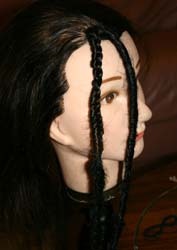 Over the section of hair. Under the dread. Over. And over. Continue until you no longer have any natural hair left. 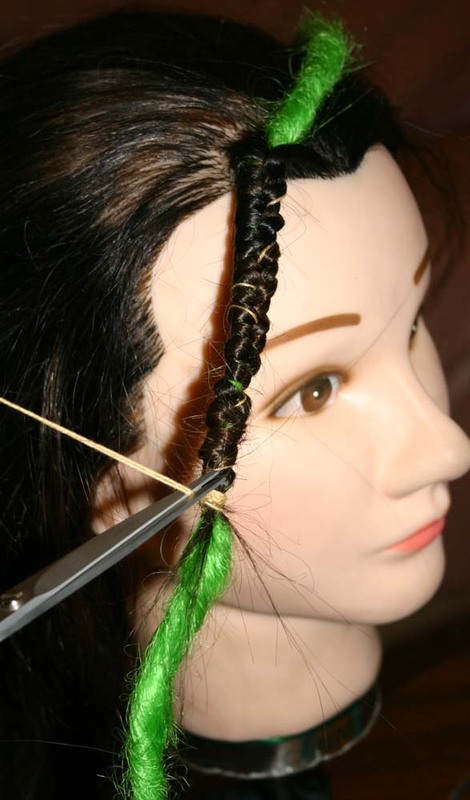 If you are using an elastic at this point, tie the elastic a the bottom of the braid. 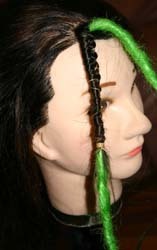 If you are using the string you should have quite a bit of length left to work with. You'll need it. Wrap the string in opposite directions 3-5 times for each string left over. Bring the ends of the string together and tie a square knot. (The way you'd make a knot by tying your shoelaces forgetting to do the bow part but doing the first part twice). Cut the left over string a few millimetres above the knot. When the string and dread are the same colour, this method allows for the dread to blend seemlessly into your hair. All content and images herein are property of Beautifully Chaotic Designs unless otherwise noted. Copyright (c) 2000-2006.
graphic design and html by malloreigh antithesis. copyright 2004.